The clock has started to tick. The Metro Vancouver region has just under 500 days, less than a year and a half, to do a lot of negotiating. The leaders in this community, on their own, will have to come up with a proposal to fund transportation expansion – mainly big-buck transit projects – that will garner majority support on a public referendum at the time of the next municipal election in November, 2014. The starting point is about $3-5 billion if both Surrey and Vancouver are to get their priorities addressed, plus some goodies for other parts of the Lower Mainland, without including the Pattullo Bridge (assuming it would be tolled, negating current provincial policy). But there are so many assumptions to consider, it’s hard to know where to start or how much will be asked. Of course it’s worth asking: Does it matter? No matter what deal is put together, the referendum will, the Premier indicates, have a none-of-the-above option. What a great opportunity for those whose mantra is ‘No More Taxes.’ What an opportunity to send a message to TransLink and the politicians that we’re taxed enough, and that TransLink has to address its own inefficiencies (including wages) before it gets another dollar. Take a close look at the chart at the bottom. 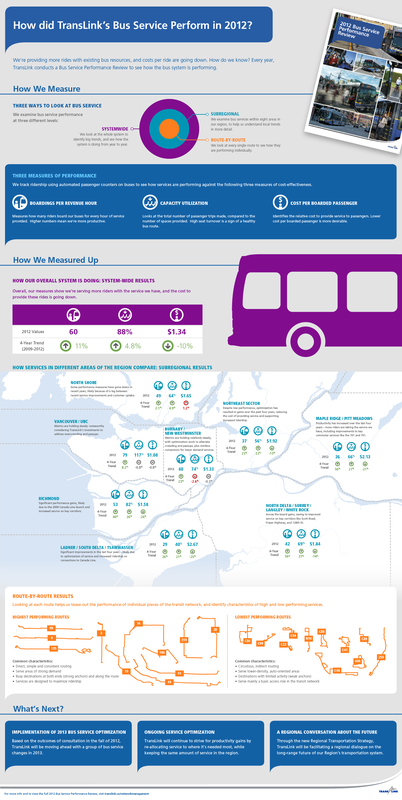 (Full size version here; the TransLink infographic is here.) You can see that the dark blue column on the left, indicating the cost per boarded passenger in 2o12, has gone down in almost every case from 2009. Indeed, only on the North Shore has there been an uptick. In other words, in unadjusted dollars, bus transportation is more productive. Even for Delta, with the least productive routes, the cost is less than a single-zone fare. The news would be even better if SkyTrain was included, which more than covers its operating costs. Okay, good news. So take a look at the comments at the bottom of the online story: uniformly negative. Even after three audits, reviews and millions in savings, TransLink still fails to get credit for being more efficient and worthy of more revenues. It remains an all-purpose whipping boy for anyone with a grudge against government, transit or life in general. The stories in the media concern themselves with the trivial – free coffee for staff! – not the importance that a good transit system has on our quality of life and the health of our economy. The model might, conceivably, be invoked to justify investments in transportation or public spaces. Already, many strategies are being pursued to improve urban development that, viewed through this new lens, are in some ways attempts artificially to ramp up density, of the physical or social-tie variety…. The argument, therefore, is that spending on transit is the way to achieve “a healthy and growing economy” that the Premier has established as the first priority for transportation in this province. But that rationale has so far been reserved for Gateway-style road investments – for which, you can be assured, there will not be a public referendum – that enable more sprawl. The challenge for the region is daunting: constructing a consensus in a very short time that will satisfy enough constituencies, with a upper limit on expenditure unlikely to be sufficient, in the face of intractable opposition and a media not likely to be supportive. Is it worth even trying if a no vote would set the region back a generation? I don’t have an easy answer to this, other that TL was on a roll back in the mid-2000s with an expansionist MoT and TL IMO seeming to will things into being (the expansion of bus service in SoF, canada line construction, removal on non-low floor buses, new trolley buses and the purchase of new skytrain cars). However, this top-down model caught blow-back (mayor’s revolt, reports of TL “being out of control”, later bus optimization chagnes, rejections of a property tax increase). The mayor’s council crystalized resistance against this, while asking for more control, even though no-one knows how that will manifest itself. They were also in support of things that seem very unpopular (vehicle levy) that previously would set victoria up as the bagman. Why does the Vancouver Sun graphic have time reversed on the horizontal axis? It implies that costs are going up. Ignorance or malice? Corey – excellent question! Hard to get this convention wrong without trying to do so, wouldn’t you think? 2 Surrey/South of Fraser transit users make less use of the provided transit than other parts of the region. It seems to me that refers to the well-known Economies of agglomeration I was already referring in a previous comment, (even mentioning Zurich like the author does! )…and obviously it makes the comment even more relevant. Thanks to admit that Gord! Thanks to admit that in the debate Surrey LRTs / Broadway subway: one is much better for the health of our economy.